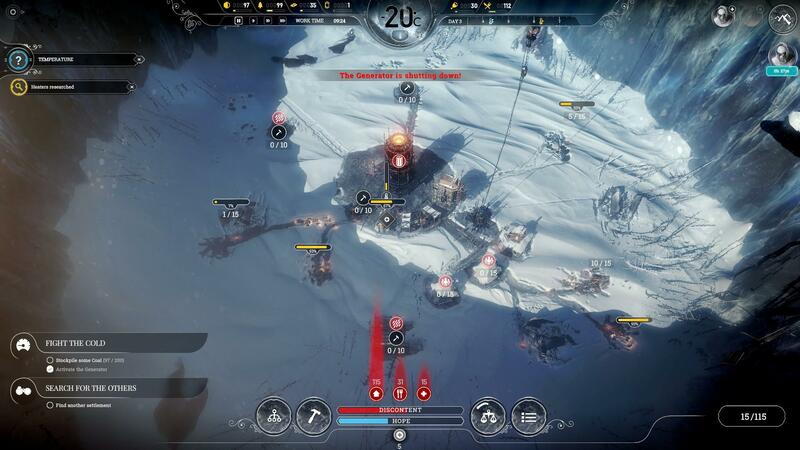 Struggling with Frostpunk? Learning curve too steep? Keep starving to death? Losing your fingers to the bitter cold?Look no further, ladies and gentlemen. I am here to provide you with the know how and the how know to surviving the first few days with optimal efficiency! And heres a bonus. Its pretty much a 100% Goodguy route and works with all difficulties, and with some variation, all scenarios! 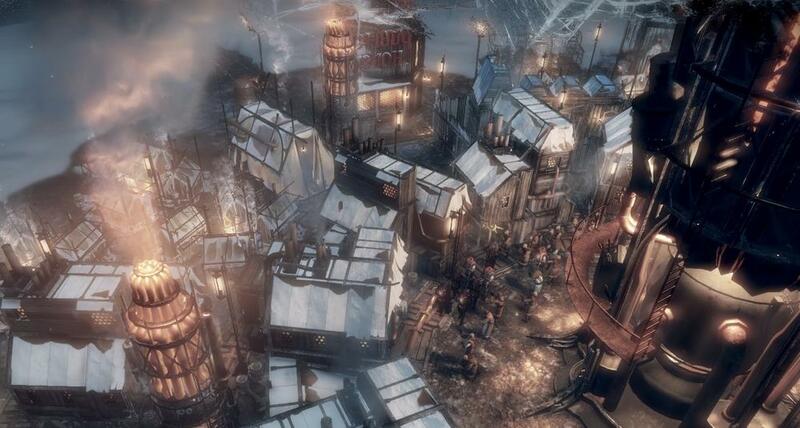 So, you've bought Frostpunk, you've played a few times, but you just can't adapt. What am i doing wrong, why are the people not doing things, why is that automaton just stood there!? Before we continue, i will show a video guide explaining more in depth and a few more parts if you wish to see the end result! The first few days are crucial to your economy. The more people to have, the more resources you get earlier, the more research and the more chance of survival. Micromanagement is so important for an Optimal start, take people off resources, notice that cooks are idle when you have no food, place them onto another resource. If you only have 1 sick citizen, remove some of your engineers, Always be wary of what is going on in your game and adapt to it. For the first 4 days (Before the temp drop), You do not need tents. 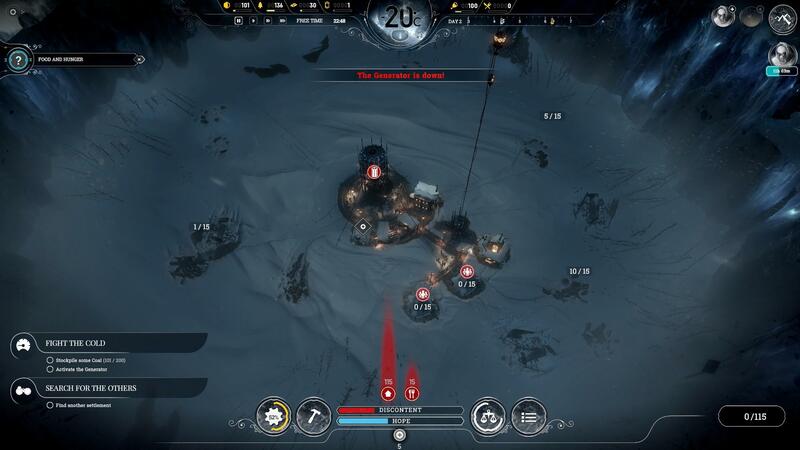 Gather as much as you can from the gather spots with your unused workers/engineers before day 4, post day 4, any gathering will lead to Gravely ill --> Death (The infirmary is too costly of a research at this point. Feel free to make a variation on this, but this works for me. So, you start with 65 Citizens in a combination of Engineers and workers, workers being your unskilled workforce, and engineers being the skilled workforce (VALUABLE). 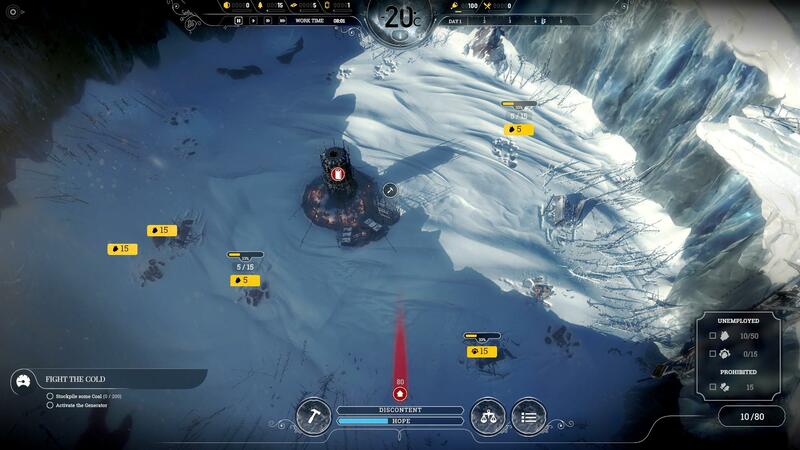 You want your BEACON up ASAP to get scouts to find more survivors. To start, do as follows. Open up the book of laws ASAP and sign the Emergency Shift Law, (Don't use it, people will die at random times through using it. Build a workshop next to your generator in the first ring. This will enable quick building and getting your engineers researching as fast as possible. Have 10 idle Engineers to build with optimum efficiency. Assign 2 x 15 people to steel. Assign 1 x 15 people to Wood. Assign 1 x 5 people to Wood. Assign 1 x 5 people to Coal. Wait for your workshop to be built. Assign 5 x Engineers to Wood. Assign 5 x Engineers to Workshop. Remove all people from Steel. Place everyone from Steel to wood. The idea is to gather as much wood as you can as it fuels all early research and all resource buildings (except gather points). 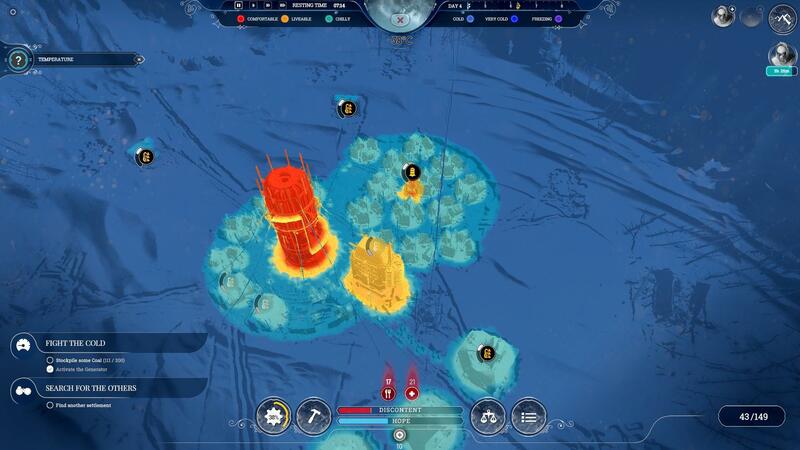 At the end of the first day, you should have successfully researched BEACON. You want to place it somewhere behind your workshop, so as to not obstruct the first circle of tents that you'll eventually want to build. End of day one should look something similar to this. Also, at this point you will want to research sawmill. This will enable you to gather a semi-reliable source of wood, with protection from the cold when the wood crate resource points deplete. 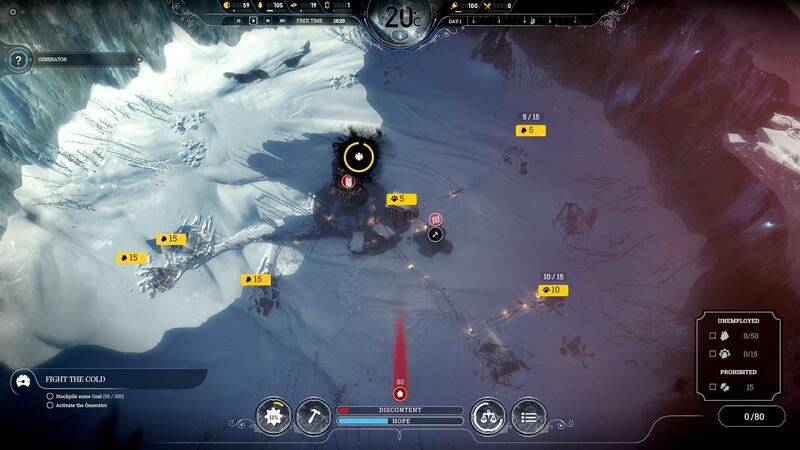 once your beacon is completed, take 5 workers off wood and you want to scout with them to the Lost Expedition. While they are scouting you're going to want to prepare for the first night, a trick is to leave your generator off till 3am. And then turn it back off at 5am, this uses roughly 20 coal, and is your ticket to gathering more important resources at the start of the game. So as day 2 starts, you're going to want to build a MEDICAL BAY around the first ring of your generator, as it doesn't provide its own heat and will not heal anyone during the cold of day 4. 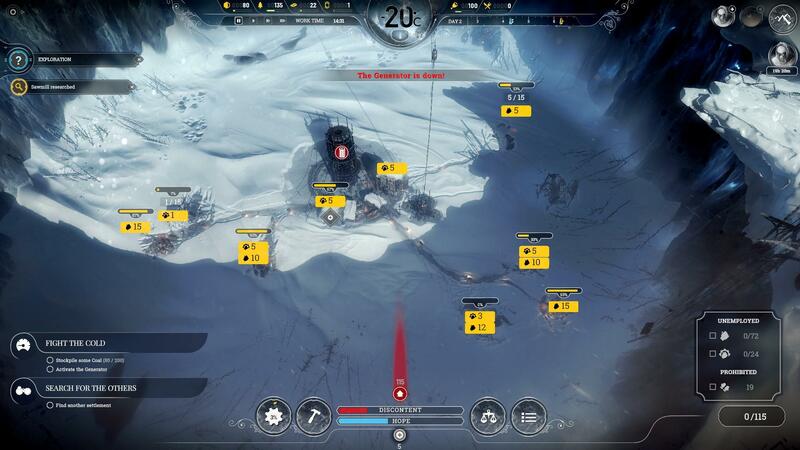 As soon as the cooldown is lifted, you'll want to sign the EXTENDED SHIFT law and go through all your resource points and switch WORKING HOURS to 6:00 - 20:00 this will give you 4 hours worth of resources per day. Do not use emergency shift, it is too risky. So for the rest of the day, you just wait for the scouts to bring in your new survivors and wait for your SAWMILL research to be completed. 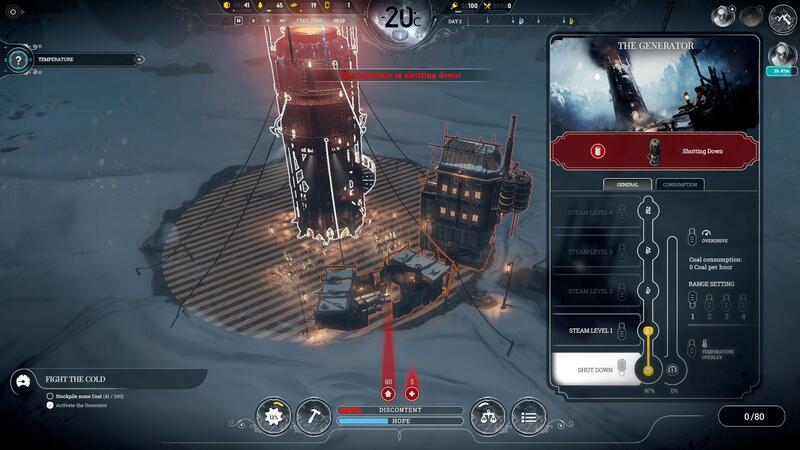 Once your SAWMILL is researched start to research HEATERS, this will be useful for when the cold hits and you're unable to work in the cold conditions, at risk of getting Ill.
By this point, your new survivors should be entering the city, assign them to steel and wood if you have any points left over and send your Scout out to look for more survivors. GLOOMY CAVE - Survivors + Risk of Losing Scouting party. The idea is to get as many survivors early on as possible so you can boslter your economy and put you in a good stead for the future. So, by this point you'll have covered Medics bays, have a large-ish, stockpile of wood, a steady flow off steel and a few people gathering coal for the 2 hours of generator time during the night. Now its Food time. You'll find that around the end of day 2 people will start to get hungry and you're going to need to rectify this with a steady income of food. I find that building 1 COOK HOUSE and 2 HUNTERS' HUTS will be enough for a while, but you won't be able to populate these buildings fully just yet, there are more important things to attend to. Build these somewhere away from the inner ring, as you have heaters now and don't need the inital ring to make these buildings workable during the colder weather. By the end of Day 2, you'll want to have something that looks like this. Populate your COOKHOUSE ready for day 3, and when you run out of food, take them out, and place them on another resource, probably steel at this point. You can exploit the way the HUNTERS' HUTS work by taking workers off a certain resource and placing them on the hunters' huts during the night shift, and then replacing them back onto the resource they were working on during the day. This is micromanagment intensive, but if you want the optimal start, it is definitely worth the attention. So, we're coming into day 3, and we're going to want to be thinking about coal production for the coming cold weather, TENTS and SAWMILLS, this part gets a little dicy, but if you followed correctly you should be fine. To start off day 3, i'm going to build another MEDICAL, as i noticed my sick is higher than what i wanted, 2 GATHERING POST'S and a SAWMILL on one of the frozen treelines. 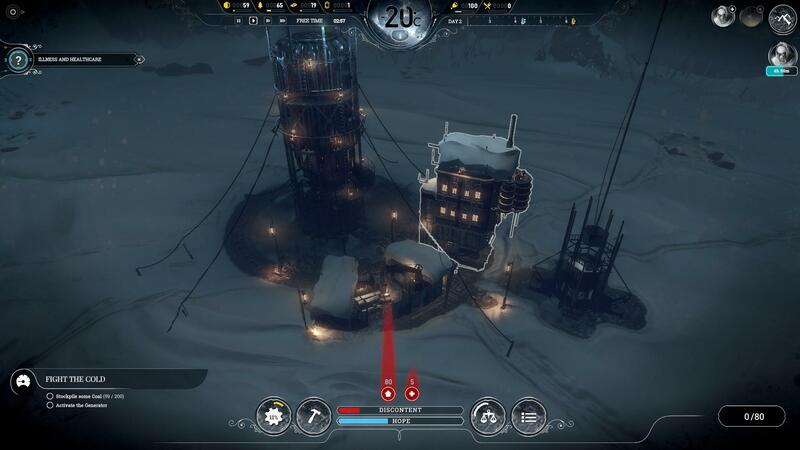 Once you've placed these buildings, you're going to want to surround the remaining areas around your generator with tents, and build a small clump which is going to be reachable by a single steam hub, turn your generator on and keep it on for the rest of the game. By this point, your gathering points will start depleating so you need to re-assigning your workers/engineers to different points. ensuring you have some kind of wood income, and coal income, Steel will come later on as we enter the 2nd tier of research. 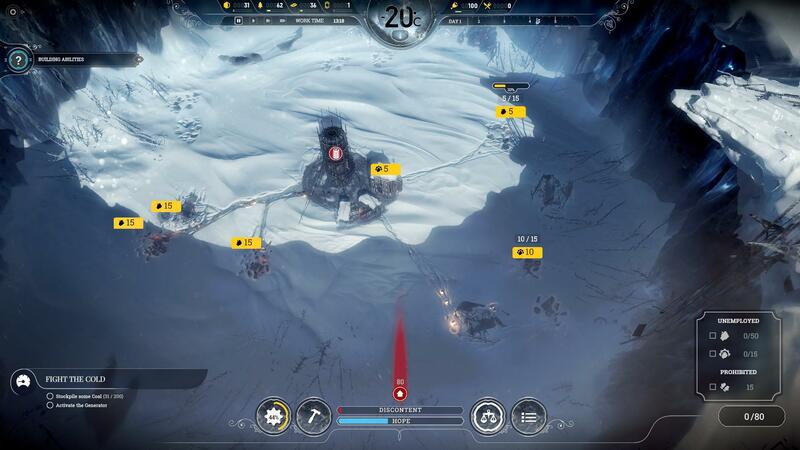 Before the cold hits, go around and remove all workers from the outlying resource points, you should have nearly gathered the wood/steel anyway, so it doesn't matter. But keeping them on the resources will make them Ill due to it being a cold area. When the cold finally hits you should be completely safe, have the infrastructure to feed and keep your people warm. Build a 3rd medical bay, and a second workshop. Make sure all the survivors that your scouts are bringing in have jobs. 0 Unemployment is the goal and will ensure you have a strong economy. From this point you'll be able to play as you normally would, with emphasis on scouting, economy management, upgrading your resource buildings. Keep an eye out for the cold on the day timer, as you'll need to upgrade your heating and insulation over time. But with this start, you should honestly be good till around day 20 without needing to worry about heating.